With today's aging population, shower chairs are increasing in popularity and they have been around just about as long as showers themselves. Shower chairs are increasingly appearing at homes due to people having mobility problems, medical conditions or loss of balance for a number of reasons. Bathrooms and shower stalls are getting bigger and most of them can easily accommodate a shower chair. The corrosion resistant materials available today are great options for constructing shower chairs. The cheaper ones are made from sturdy plastic and some have thin and strong designs. They are lightweight, easy to maneuver and can support heavy loads. Some models have seats that flip up or disassemble for easy storage. Be sure that any chair that folds or collapse is snapped into the proper position when being used. 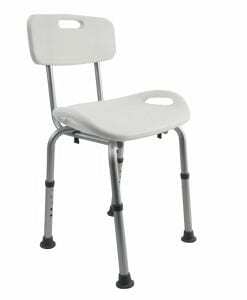 Some shower chairs are just big stools with no back, while others have back support and these ones take up a bit more room. Think about your requirements before buying your shower chair. 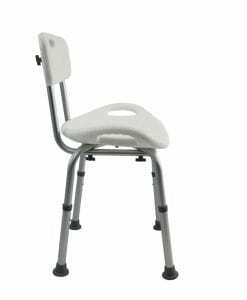 Choose one that is safe, comfortable, has seating that matches your height and gives you the proper support you require. If you find the unpadded chairs too uncomfortable, try a padded shower chair. They are usually covered with thick, high-quality vinyl that is waterproof. Most have slip proof leg bottoms made of rubber or some other slip proof material. Some shower chairs have wheels on the legs and are ideal for people with limited mobility. These chairs are lightweight and sturdy and can be easily moved over a shower lip, but the rollers provide easy maneuverability once inside the shower. Some models have wheels that lock on the outside of the legs, but they can usually be locked when needed in the shower. 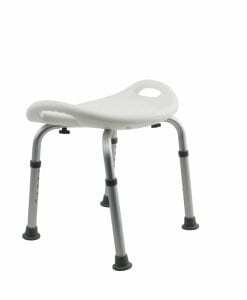 There are models that have chair legs that slide upwards as weight is applied to the chair. 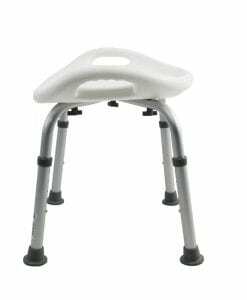 These are very handy as you can roll them into the shower and once you are seated, the nonslip legs cover the wheels and the chair is prevented from sliding. You have the best of both worlds with this model!